This must be what it’s like to enter the Stadium at a Super Bowl. The feeling that this event is special, and that you’re kind of privileged to be able to attend. You snake through the line, thankful the freezing winds off the mountains are not blasting through the valley. You go swiftly through security, have your ticket scanned, and begin the walk to the Stadium. You pass by exhibition areas of some of the TOP sponsors, like Coca Cola and Omega. You make your obligatory stop at the gift shop given the name to suit the moment – The Super Store. And then you file into the Stadium. It’s not a massive stadium. In the shape of a pentagon, all spectators look down on an oval arena. When I got to my seat in the fairly narrow seat rows, doing the movie theater shuffle – “excuse me ma’am, sorry sir,” I removed the bag full of PyeongChang Olympic swag that was on everyone’s seats, and sat down. If you came to see everything close and personal, then you shouldn’t have gone to the event. Even the big screen televisions were relatively small and on the whole not helpful. Understandable in a way since the Stadium will be torn down right after the Olympics – temporary venues are significantly cheaper to build than permanent ones. Most of the spectators were seated an hour in advance of the start, and the pre-ceremony MCs got us started by having us practice a count down from ten to one in Korean, and practice K-Pop dance moves to keep us warm. There were volunteers in red scattered throughout the Stadium to model the dance moves. The one about 15 meters from where I was sitting was particularly committed. He danced enthusiastically during the entire march of nations, which lasted about an hour! On occasion I could see to my distant right a group of women clad in red – the famed North Korean cheering squad. But just to keep geo-political balance, a man who looked suspiciously like President Donald J. Trump would parade by the walkway in front of our section. For much of the ceremony, there wasn’t a bad seat in the house. My seat was directly across from the entry part for the marching athletes, so it was central. And yet when it came time to light the cauldron with the Olympic flame, I had to crane my neck all the way to the right. I got to see how beautiful Yuna Kim was as she skated at the top of the Stadium this morning when I watched the clip on YouTube, but what I was able to see was a slightly blurry view through my iPhone which I was able to position so that I could see what was happening on the phone’s screen. I couldn’t really see the lighting, but I could see the burst of fire, the explosions of fireworks, and the cheers of the crowd in an intense personal way that cannot be experienced on the screen. And then began the incredible in-Stadium fireworks display that stuns you with its proximity. And then the ceremony was done. I filed out with the masses, fairly quickly. I wasn’t so cold, as I was bundled properly, but I was hungry and fish soup awaited on the first floor. As I slurped a late snack, I noticed a commotion. The North Korean cheering squad had made their way down the stairs and were lined up in rows. While hugely popular in North Korea, it is unlikely they have ever been surrounded by so many South Koreans and foreigners with cameras and phones. People who never imagined to be so close to a North Korean, let alone dozens of young attractive North Korean women, snapped and selfied away. I noticed just before they left, and somehow while holding my soup bowl in one hand, I took two quick pictures with my SLR in the other. Fortunately, one was in focus, proof of my personal encounter with the enemy. All pictures and videos were taken by the author. K-Pop’s really popular all over Asia. But how about NK-Pop? Thanks to a recent rapprochement by the two Koreas, North and South Korea will unite under the name “Korea” at the 2018 PyeongChang Olympics. In addition to a figure skating duo which had actually qualified for the Games, an additional 22 athletes will be added to the roster of participating athletes. 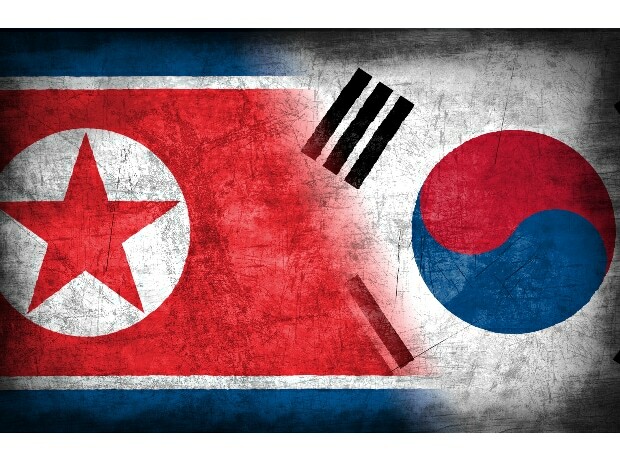 A stunning turn of events only weeks before the commencement of the Games, the governments of North and South Korea are working to de-escalate the tension that has risen in the second half of 2017, as test missiles from North Korea flew menacingly close to Japan, and antagonistic words between the American and North Korean leaders were exchanged. South Korean President, Moon Jae-in, has been actively seeking to bring North Korea to the table, and to the PyeongChang Olympics. On January 18, 2018, weeks before the Winter Games start on February 8, the two sides negotiated the presence of not only athletes and officials in PyeongChang, but also a wide variety of teams that would serve to promote North Korean arts, sports and of course, the government leadership. That includes a team of taekwondo athletes, which of course won’t compete because it’s not the Summer Games, but instead will perform in demonstrations. Participants at the PyeongChang Winter Games will be graced by the presence of the so-called “Army of Beauties,” a hand-picked cheering squad of 230 women who will chant, sing and cheer at the Games opening ceremonies, among other events. The Samjiyon Art Troupe, an all-purpose group of 140 singers, dancers and orchestral members will also perform during the Olympics. This particular group is led by Hyon Song Wol, who is the leader of the Moranbong Band, an all-female band that is more well known, and has been performing pop rock since 2012. It is reported that North Korean leader, Kim Jong-un, helped establish the band. Hyon is no ordinary musician. She was a member of North Korea’s delegation visiting South Korea for the rapprochement talks, and is perceived to be close to Kim Jong-un. There have even been rumors that she was romantically involved with Kim before he became North Korea’s supreme leader. Rumors don’t stop there regarding Hyon. It was believed in 2014 that Hyon was dead, executed by the hand of the State, for the charge of – wait for it – starring in a pornographic films. The rumors of her demise were apparently greatly exaggerated. Today, Hyon appears to wield significant political influence. And at the opening ceremonies of the 2018 PyeongChang Olympics, Hyon and the Samjiyon Art Troupe will take the spotlight on the biggest stage in sports. He was 16, and he was an Olympic gold medalist. At the age of 20, he won his second gold medal. At the age of 24, Billy Fiske had an opportunity to head up another US bobsleigh team, this time at the 1936 Garmisch-Partenkirchen Winter Olympics in Germany. As a teenager, Fiske went to Trinity College in London, England, to study economics and history, as well as drive his Bentley down the English country roads as fast as he could. In 1938, Fiske moved back to England, where he made friends with members of the British air force at the White’s Club in London, and married an English girl named Rose Bingham. He returned to New York. But when Germany invaded Poland, and Britain and France declared war on Germany two days later, Fiske felt he had to return to England. In fact he was the first. He was also one of the first Americans to perish in World War II. The Battle of Britain began on July 10, 1940 when Luftwaffe arrived in London in full daylight to bomb the British capital. As a newly trained pilot in the 601 Auxiliary Air Force Squadron at Tangmere, “there was some apprehension in 601 about ‘the untried American adventurer,” as quoted in HistoryNet. Ten days later, the rookie fighter pilot was in the air in a 601 plane to make patrols, apparently learning quickly how to maneuver the plane effectively. Three weeks later, Fiske, on August 16, 1940, Fiske was trying to get his plane back to the base after an attack by Luftwaffe. Shot up and badly damaged, Fiske glided his Hurricane fighter plane back to the airfield, hitting the ground hard and exploding into fire. Dragged out of his plane, Fiske suffered severe burns and was rushed to a hospital. But the shock from the burns was too great, and the Olympian and American RAF fighter pilot, Billy Fiske, died the next day at the age of 29. It was 1952 at the Helsinki Olympics, and the Cold War was heating up. Making their first appearance at the Olympics were the Soviet Union. And in the 3,000-meter steeplechase, the favorites were Russians Vladimir Kazantsev, and Mikhail Saltykov, both world record holders with times under 9 minutes. Horace Ashenfelter, an American whose best at the time was nearly 18 seconds slower than Kazantsev’s best, was not given a chance to win the steeplechase competition. It was evident at Wednesday’s steeplechase heats that the final would bring about the carnival’s first head-on, man to man clash between an American and a Russian. A lot of people had been waiting for such a match ever since it became apparent, long before the games opened, that the 15th Olympics would be chiefly a Russian-American struggle. Before the heats, however, nobody had dreamt that the match might come about in the steeplechase. All the tall tales about a generation of supermen rehearsing behind the iron curtain had made special mention of Vladimir Kazantsev of Kiev, who had been charging over the obstacles at speeds the outside world had never seen. And yet, Ashenfelter was never fazed by the challenge. As stated in this interview, Ashenfelter was in prime shape and had nothing to lose. I’m a pretty confident guy, actually and – put it this way – he had to beat me. It was the first time and only time where I had about three weeks of controlled training and rest. I had fine tuned my weight and weighed 128 pounds which I carried on five feet nine frame as compared to my normal weight of 140. I was in outstanding shape and had no bad luck occur. I was just going to stay with the pace as long as I could and to make the pace if I had to – I didn’t mind that. He got suckered by his coaches as his plan they had was for him to stay with me. That meant that he was running on my right shoulder the whole race and adding three or four yards to each lap. I ran him a little bit wide on the corners and we bumped several times as he was running that close to me. That didn’t bother me but it may have bothered him – I don’t know. I knew I had a lot left at the end. It was not known at that time that Kazantsev was also a KGB Agent, but one could imagine that Red Smith’s rhetoric would have been even more provocative. On January 6, 2018, Horace Ashenfelter passed away at the age of 94.